This is the eighteenth set in this series that I’ve reviewed and I’m delighted – but not surprised – to find that the standards of performance remain as high as ever. It scarcely needs saying that the same is true of the standard of the music itself. Though this is Volume 17 in the cycle we are taken right back to the start of the Pilgrimage. After splendid performances of the Christmas Oratorio in the Herderkirche, Weimar immediately before and after Christmas 1999, which have been available on DVD for some time (see review), the Pilgrimage really began in earnest with these concerts in Berlin as the new year, and the new millennium, began. There are six surviving Bach cantatas for New Year’s Day, including Fallt mit Danken, fallt mit Loben, the fourth cantata of the Christmas Oratorio. Another one, the jubilant Singet dem Herrn ein neues Lied! BWV190, was given in the very last concert of the Pilgrimage and was included in Volume 16 (see review). 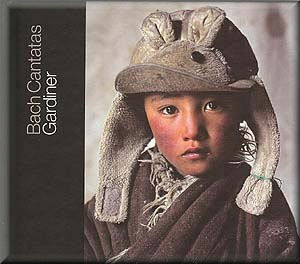 On this CD Gardiner gives us the other four New Year cantatas. BWV 143 probably dates from 1708 and as such is a Mühlhausen cantata, though there are some doubts as to whether or not the music is actually by Bach. Alfred Dürr’s judgement is that the work is “perhaps a little colourless in invention”. It’s interesting to note that, unlike the other three New Year’s Day cantatas included here, the text bears no real relation to the Epistle or Gospel readings appointed for the day in the Lutheran liturgy. The orchestra includes timpani and three horns. The two key soloists are the tenor and the bass and it’s interesting to see that the singers here, James Gilchrist and Peter Harvey, were also involved in the very last concerts of the Pilgrimage, twelve months later. As we’re discovering with the progressive releases of the CDs, both singers were to be cornerstones of the whole venture and on their respective showings in this concert it’s not hard to see why. The tenor has two arias in BWV143. Gilchrist does well in the first of them, ‘Tausendfaches Unglück, Schrecken’, but the second aria, ‘Jesu, Retter deiner Herde’, is even better suited to his voice and he spins its long vocal lines seamlessly. The short bass aria, in which the orchestra’s three horns join, is dispatched imperiously by Harvey. The cantata concludes with a vigorous chorus, which is excitingly done by the Monteverdi Choir, though it doesn’t seem to me to represent Bach at his extrovert best. There’s nothing “colourless” about BWV41, which is a superb cantata. The orchestral scoring is even more resplendent than that for BWV143. In place of the three horns Bach employs three trumpets and he adds a trio of oboes to the mix. It begins with a huge choral fantasia, aptly described by Gardiner as having “epic sweep”. The chorale melody is in the soprano line, while below and around it Bach weaves a virtuoso display of vocal counterpoint. The Monteverdi Choir is quite superb in this movement, with the festive trumpets and drums adding great brilliance. Around the midway point Bach unexpectedly interpolates a short section of slower, more reflective music, which is a masterstroke. This is swiftly left behind in an exciting display of fugal pyrotechnics before Bach returns to his opening material to conclude this astonishing, thrilling movement. Bach’s wonderful music fits this lovely idea like a glove. The tenor aria ’Woferne du den edlen Frieden’, winningly sung by Gilchrist, features a fine obbligato for violoncello piccolo. . The instrumental part is splendidly done but, even so, it’s Gilchrist’s clear, expressive singing that particularly catches the ear. The bass recitative that follows is interesting on account of the brief, vehement interjection by the choir of the phrase ‘Den Satan unter unsre Füsse treten’ (“Let Satan be trodden under our feet”), which Gardiner perceptively suggests was Bach’s way of “voicing the whole congregation’s New Year resolution.” The exultant finale chorale is decorated by fanfares from the trumpets and drums. This fine cantata receives a stirring performance. BWV 16 was first heard one year later, in 1726. As Gardiner says, it is “concise and pithy” and it’s the most modestly scored of the cantatas we’ve heard thus far. Despite its relative brevity there are some notable movements. One such is the aria ‘Lasst uns Jauchzen, lasst uns freuen’, a forthright piece in which the excellent Peter Harvey and the choir combine to good effect. The tenor aria ‘Geliebter Jesu, du allein’ features an oboe da caccia obbligato and one relishes the contrasting timbres of voice and instrument. The text is a heartfelt expression of trusting faith, beautifully echoed in Bach’s music, and Gilchrist puts the aria across marvellously. To conclude we are offered BWV171. This seems to begin in media res, as Bach plunges into an energetic fugal chorus without so much as a note of instrumental introduction. Two violins weave a dancing obbligato round the tenor aria ‘Herr, so weit die Wolken gehen’. This piece provides a stern test for James Gilchrist’s breath control but he passes the examination with ease. The soprano aria ‘Jesus soll mein erstes Wort’ is a parody of a movement from Bach’s secular cantata BWV205. Gardiner isn’t quite as convinced as Alfred Dürr that the transfer works, feeling that the revised word underlay doesn’t quite fit the music. What does work, without doubt, is Ruth Holton’s light airy singing. In the closing chorale Bach reprises the fanfares with which he burnished the corresponding movement in BWV41. Gardiner suggests in his notes that this was a reminder to the Leipzig congregation of the music Bach had previously given them. I have to say I do wonder how many of the good burghers of Leipzig would have had such good memories. In the year 2000 the Sunday after New Year fell on the very next day so there was no rest for the Pilgrims. If their programme for that day looks short this is because only two cantatas for that Sunday have survived so that the audience were also treated to two cantatas from Christmas Oratorio. Gardiner points out the almost seismic shift of mood as compared with New Year’s Day but this is perhaps not surprising since the Gospel for the day relates the Massacre of the Innocents and the Flight into Egypt. BWV 153 is in many respects a turbulent cantata. The opening chorus is vehement – in Gardiner’s words it seems as if it “should be delivered as a collective shout or clamorous plea, upbraiding God”. Certainly the Monteverdi Choir attacks the music vigorously. Later comes a searing tenor recitativo, after which the second chorale comes as something of a respite. But the respite is short lived for the tenor aria that follows, ‘Stürmt nur, stürmt, ihr Trübsalsweter’ (“Rage then, rage, affliction’s storms”) is a fiery piece that would not have been out of place in one of Bach’s Passions. In the subsequent bass recitative, splendidly articulated by Harvey, Bach and his librettist start to change the mood to one of solace and confidence in Christ, but not before the grim reality of Herod has been confronted. The more tranquil mood continues in the dance-like alto aria ‘Soll ich meinen Lebenslauf’. This is warmly sung by Sally Bruce-Payne, a singer who I don’t think we’ve encountered in previous volumes. The cantata ends with a three-verse chorale, which is delivered in a delightfully sprightly fashion. BWV 58 is a most economic cantata, requiring only soprano and bass soloists and modest instrumental forces. This was probably a deliberate and pragmatic decision by Bach in order to give a rest to his choristers after the vocal rigours of Christmastide and before the impending celebration of Epiphany. The resulting cantata is one of those in which the bass is cast as vox Christi while the other soloist, on this occasion the soprano, represents the Soul. The cantata has the same title as BWV3, a cantata for the Second Sunday after Epiphany, encountered already in Volume 19 (see review). This is because both include some words from the same sixteenth-century Lutheran hymn by Martin Moller. It seems that BWV58, though it probably originated in 1727, only survives in a revision dating from 1733 or 1734. One of the best sections of the cantata, the aria ‘Ich bin vergnügt in meinem Leiden’ was composed as part of that revision. Ruth Holton sounds touchingly vulnerable in this aria and the plangent violin obbligato complements her singing beautifully. Both she and Peter Harvey sing excellently throughout this cantata. As will be evident from my comments, the performance standards in this latest volume are fully up to what we’ve come to expect as the standards of the house. So too are the notes by Sir John Eliot Gardiner. It’s highly stimulating to read his Pilgrimage journal on an instalment basis but I hope that sooner or later the entire journal will be published in book form to be enjoyed from start to finish. I made a particular point of listening to the first of these two discs on New Year’s Day, simply for pleasure. It’s hard to imagine a better way of greeting an incoming year than with Bach’s wonderful, uplifting music, particularly as the perfect antidote to these troubled times in which we live.